After the sides of the box were assembled, I moved on to making the back piece. 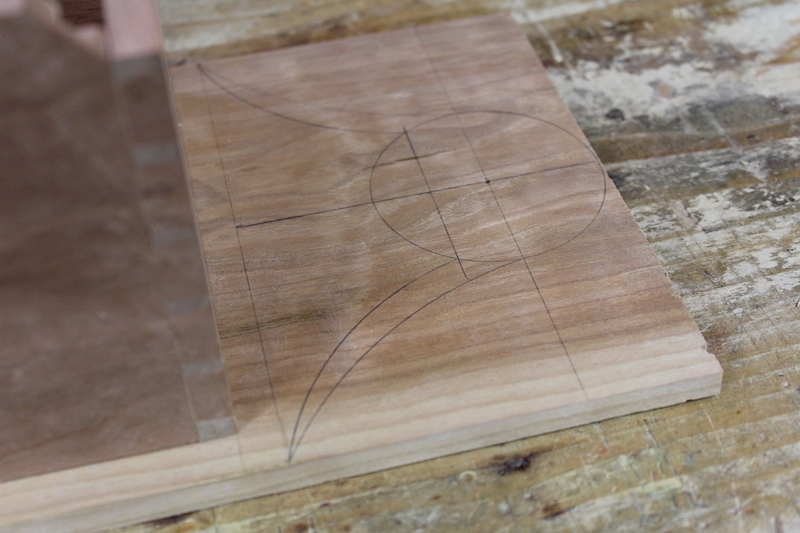 This piece would be a simple rectangle for a box meant to sit on top of a table. However, I wanted to reproduce the wall hanging version, so after sizing the stock, I first needed to lay out the scroll work at the top. Layout of the decorative scroll work is done primarily with a divider. I played with the design a little as I wasn’t sure if I wanted to keep the scroll work like the original, or smooth it out. 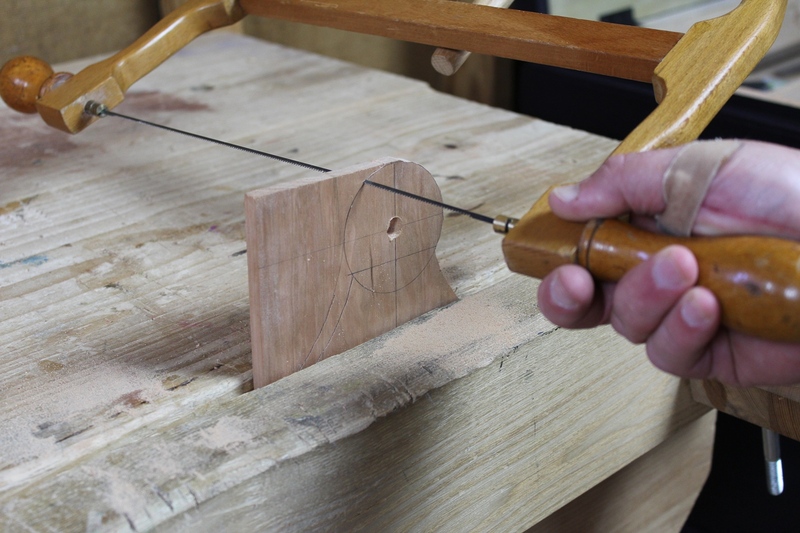 The inner line is closer in design to the original, but requires more carving/chisel work to smooth out the transition between the lower arc and the circle. The outer line is the change I played with making to the design. This would create a continuous cyma curve from the shoulder to the top of the box. 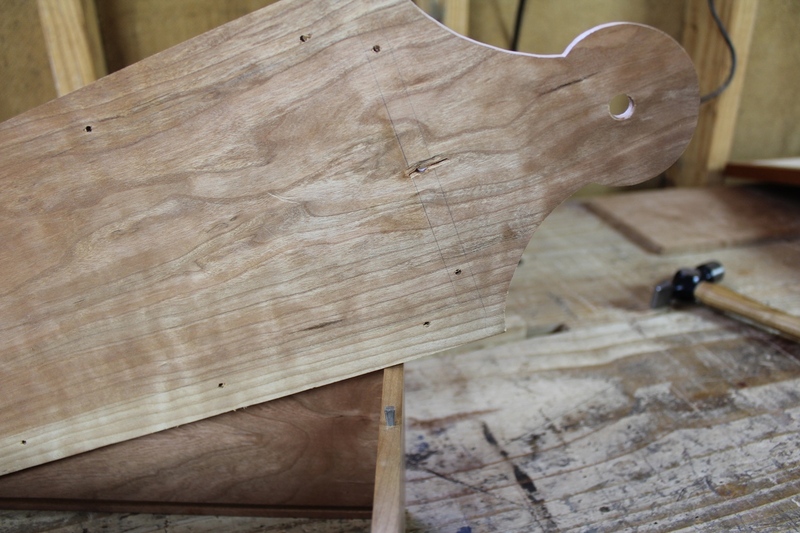 This would be easier to smooth out with spokeshave and scrapers since there would not be any inside corner. However, in the end, I decided to stick to the original’s design. 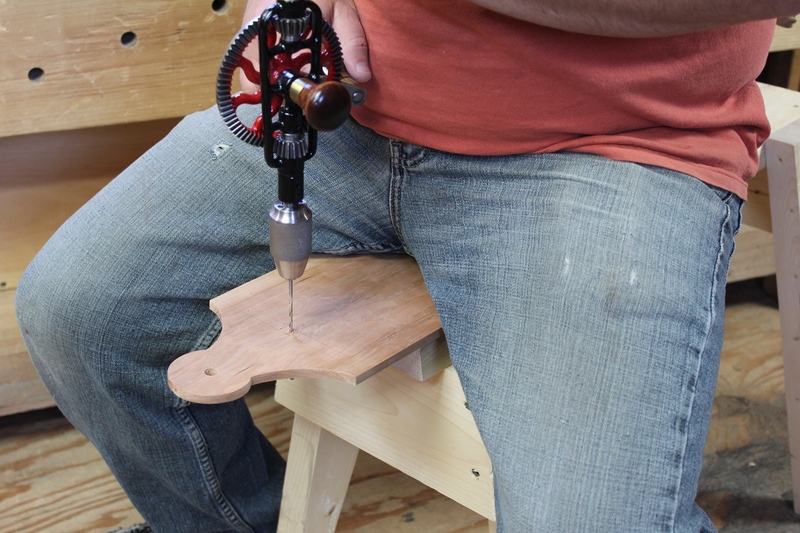 Boring the hang hole with a brace and #6 bit. 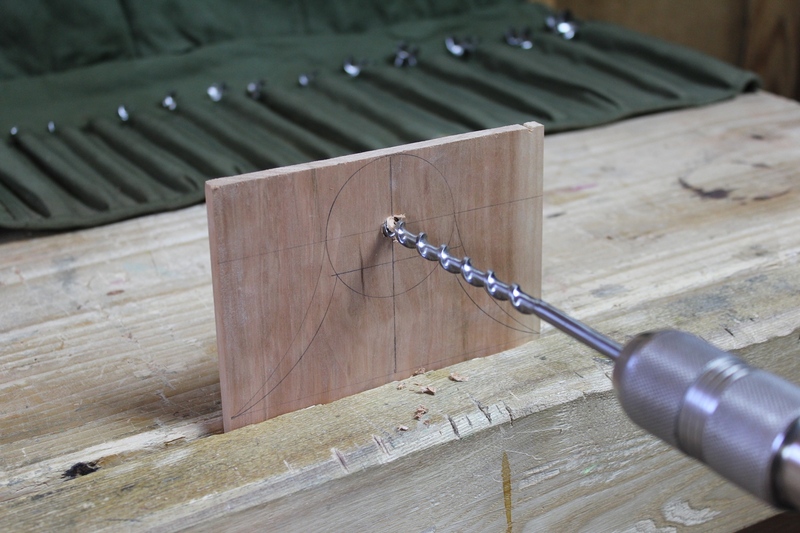 I started by boring the hole that the box would hang from with a #6 (3/8″) auger bit. The stock is only a hair less than 3/8″ thick, so it was important to stop as soon as the lead screw started to poke through the other side. Then I turned the stock around and finished the hole from the back side. 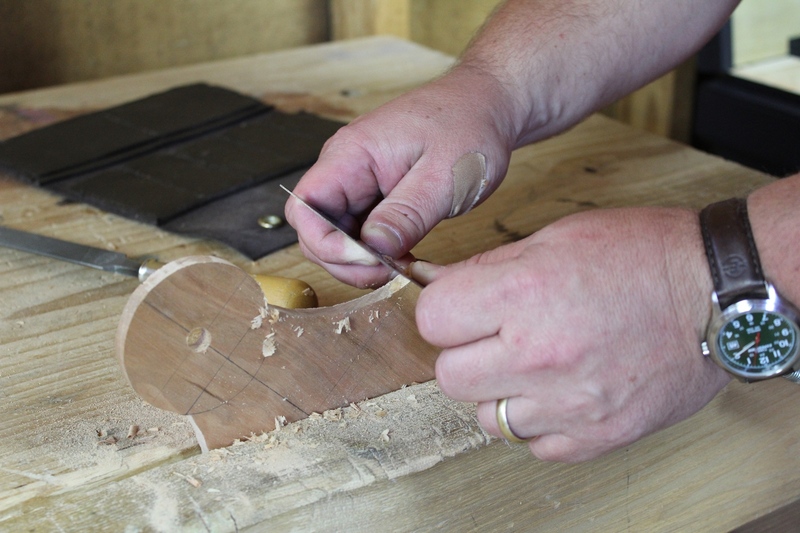 Sawing the curves with a turning saw. After the hang hole was bored, I used a turning saw with a fine toothed blade to cut out the curves. My saw is an antique saw that I modified to accept the Grammercy blades. It’s a bit top heavy, however, and has never been my favorite saw. Still, I’ve been using it this way for many years now and it does an acceptable job. I’ll make it better or replace it some day. It just never seems to be a priority. 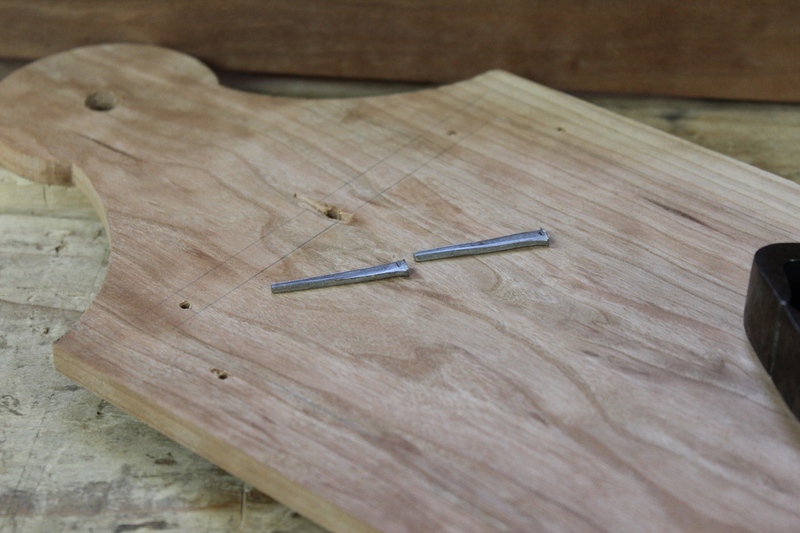 The saw marks left from the turning saw can be removed and the curves faired with a variety of tools. I used a combination of spokeshave, bench chisel, half round file, and card scraper. Drilling pilot holes for cut nails. The back is simply nailed on to the box with cut nails. These require pilot holes to prevent the stock from splitting. 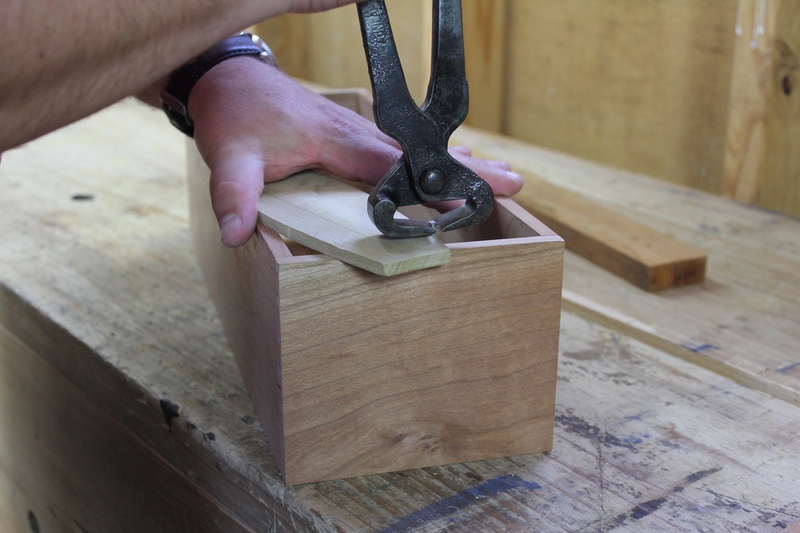 Because the stock is so thin, however, the location of the pilot holes needs to be laid out very precisely in order to ensure that the nail is in the center of the box sides. To do this, I positioned the assembled box sides on top of the back and traced around both the inside and outside of the box sides. I then was able to make the pilot holes right in the center of the pencil marks. Then I made my first mistake. The back of the box was removed, but the nails stayed put. After drilling the pilot holes for the cut nails in the back of the box, I wanted to mark and drill a couple of the pilot holes in the box sides while I still had the pencil marks. The pencil marks made it easy to realign the back on the sides. My goal was to mark and drill a pilot hole in each end to make realignment easier once the pencil marks had been removed. However, I got a bit ahead of myself. I was thinking ahead to the next step and actually drove the two end nails in the ends home before I realized my mistake – I had not yet finished the back of the box. So using a scrap block of pine and my hammer, I knocked the cherry back of the box off of the sides. However, the cut nails held tight in the box sides and pulled right through the cherry back board, pulling a chip out of the board. Unfortunately I never found the chip to glue it back in. Fortunately, the majority of the chip will be covered when the back is nailed back on. Unfortunately, the entire chip will not be. Oh well, we’ll just call it character. Removing the cut finish nails. Removing the cut finish nails from the box sides required quite a bit of persuasion. These were only 1-1/4″ long fine cut finish nails, however, the wedge shape of the nail ensured it was not coming out easily. If you have ever wondered about the holding power of cut nails, wonder no more. I can tell you from experience (unfortunately more than one experience) that in most cases, the wood will break before the nail comes out. Small cut finish nails hold much stronger than you think. Posted in Fasteners, Materials, Project Logs and tagged cut nails, sliding lid candle box.